Firefox allow users to save login information including username and password for various online services like email websites, online banking portals and more. With login details of websites stored in Firefox 4 browser itself, it is important to secure this information. If some other user open same website on your computer, Firefox 4 browser will automatically login into website using saved username and password information. You can easily prevent this by creating master password to secure and protect saved password information. Once Master Password is setup, user will have to enter that password to allow Firefox 4 browser to auto login into website whose login information is already saved. Please note, you do not have to enter master password everytime you try login into specific websites – it is required and done once per Firefox session. 1. 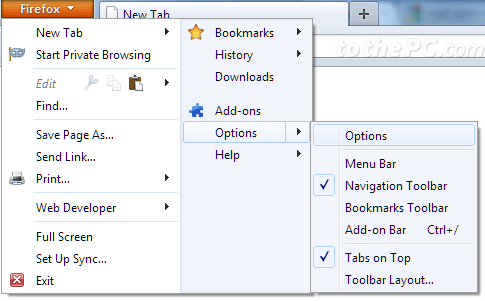 Open Firefox browser, click Firefox button and then goto Options > Options. This will open Options dialog box in your Firefox browser. 2. Click on Security tab at the top of Options dialog box. Then click to check “Use a Master Password” option. This will open ‘Change Master Password’ dialog box. 3. Enter password of your choice and set it as Master Password by clicking OK button. 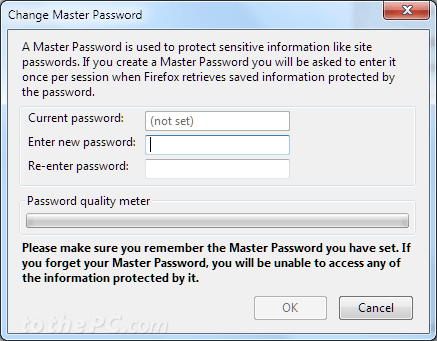 Specific password will be saved in Firefox and used as Master Password. 4. 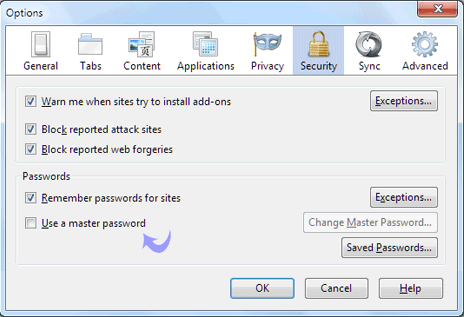 You can easily change Master Password in Firefox browser. Just click ‘Change Master Password’ button to edit and enter new Password. For now on, everytime you open Firefox browser and try to auto login into website using saved password information – you will get prompt to enter master password. For sure one easy and quick way to secure login information stored in Firefox browser.